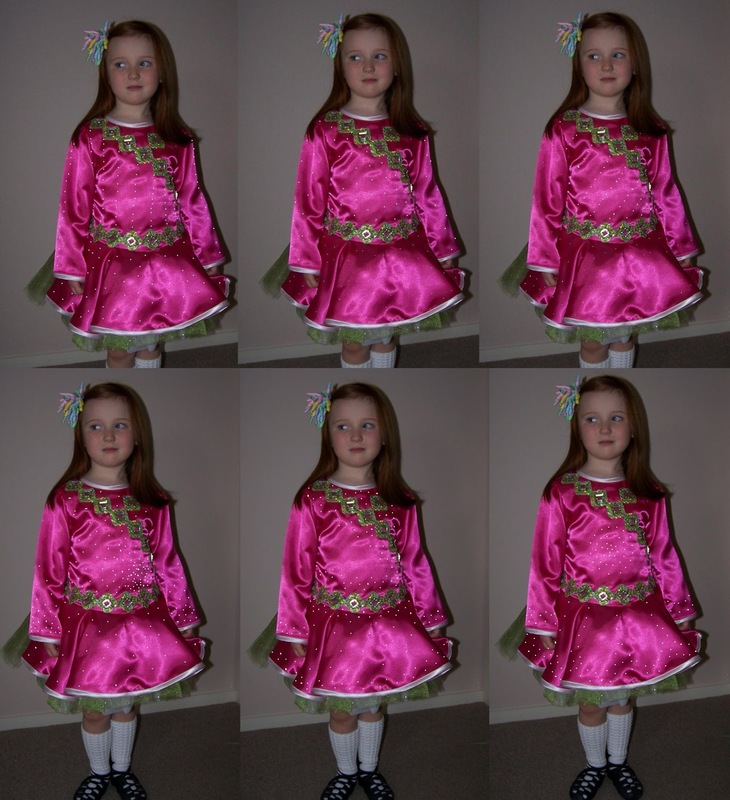 Straight after making the first Irish dancing dress for my Little Miss, I was itching to get started on the next... However, there's no point replacing her perfectly fine dress while it still fits her! You can see posts about making the dress here, here, and here. 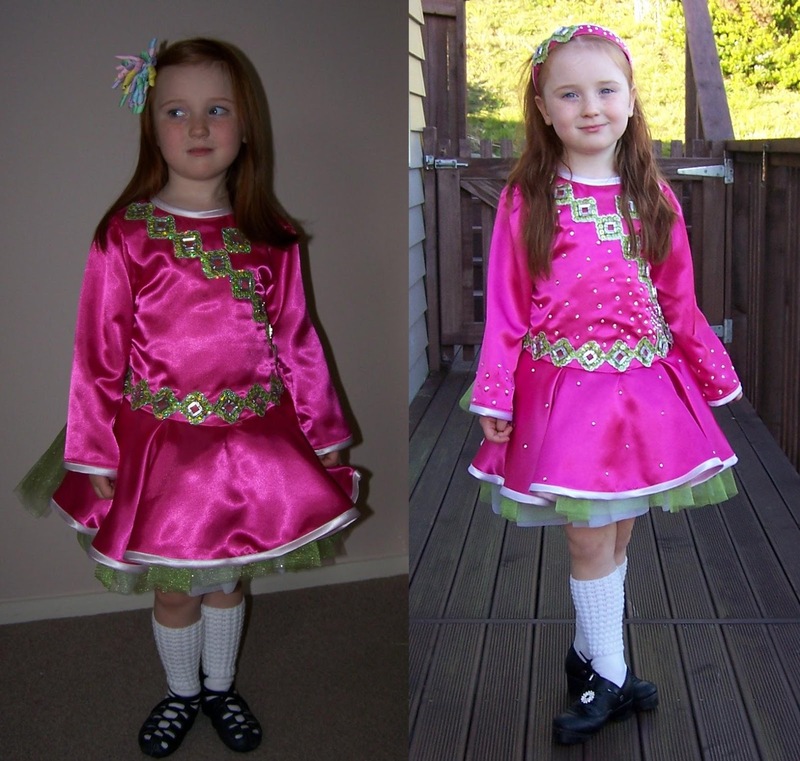 Whenever I start searching random stuff on the internet, I always end up looking at Irish dancing dresses and thinking about the next one. So much looking, and thinking, and planning, and getting frustrated at having to wait!!! And then I found some photos of dresses before and after adding crystals. Light bulb! So I played around with a picture of the current dress in Photoshop, purchased some crystals, got my Gem-Tac out, and ta-da. I used photoshop to try out a few layouts because it's a lot easier than trying to lay out stones on slippery satin. The Little Miss and I both had a play with layout ideas and then we decided on which one we liked best (and that I thought I would be able to execute best). After we settled on a design, I did my best to lay the stones out on the actual dress to get an idea of how many I would need for each area of the dress to make sure I didn't get carried away and run out! I wrote down approximate numbers of each size needed for each area and laid out on the table the maximum number of stones that could be used for the area I was working on. I used some blu-tack on the end of a pencil to pick up the stones and push them down onto the dress - I would roll the pencil to remove it from the stones, but sometimes also needed a little help from my fingers to get the stones to stay on the dress not the blu-tack. I started by putting the glue directly on the back of the stones, but for areas like the sleeves where placement was more precise, I found it easier to put a little dab of glue where I wanted the stone to be and then press the stone into it. Because of the poofiness of the skirt, I found putting a cushion in the bodice helped make a flatter surface to work on. I started on the front bodice, skirt and sleeves and let lay on the table overnight to set. I then turned it over and did the back. I let it sit for a short time and then I couldn't resist and had to go back over the front and add even more stones! After about an hour I hung it up to let the glue set completely. I also added some stones to the headband I made to match the dress. I used size ss20 and ss30 Preciosa* flat back crystals in 'AB Crystal' for this dress. I ordered 100 of each size and ended up using 89 ss20's and 78 ss30's for the dress and another 9 ss20's and 5 ss30's on the matching headband. I'm very pleased with how it's all turned out, and I had fun doing it, but I still have a ways to go in perfecting my glue application! Oh, and most importantly, the Little Miss is thrilled with it! She spent quite some time playing with the reflections they made from the sun. *Most ID dressmakers will only use Swarovski crystals and would shun my use of Preciosa, but the Little Miss is still a novice and only competing locally (not to mention she's only just turned 6!) so I decided to go with Preciosa as it's a little cheaper, but not low budget acrylic. I compared these stones up close to the Swarovski ones I have and the Swarovski's do have a little more sparkle, but not enough for the average person to notice - especially from a distance. But that's just my opinion, and I'm glad I chose to save a little bit of cash on this one.